MYSTIC, Conn. (October 30, 2013) — Mystic Seaport will celebrate the 72nd anniversary of the arrival of the 1841 whaleship Charles W. Morgan to Mystic, CT, by offering free admission to all visitors on Saturday, November 9. The Museum will be open from 10 a.m. to 5 p.m. Visitors can explore the 19th-century village, walk through historic exhibits, and of course go on board the Morgan, There will be special interpretative talks and demonstrations throughout the day. The Morgan is the last wooden whaleship from the age of sail and is the oldest American commercial vessel still afloat. After an 80-year whaling career and 10 years as an exhibit near New Bedford, the Morgan was at risk of being broken up when she was offered to the Marine Historical Association (now Mystic Seaport). She was towed up the Mystic River to arrive at her current home on November 8, 1941. 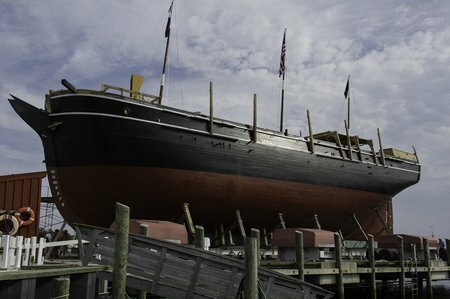 The acquisition of the ship significantly raised the stature of the Museum and helped put the town of Mystic on the map of tourist destinations in New England. Charles W. Morgan Day is held in conjunction with Mystic Restaurant Week, in which select local restaurants, including the Museum’s Latitude 41° Restaurant & Tavern, offer special one-price $13 lunch and $20.13 dinner menus. The week runs from Monday, November 4 to Sunday, November 10. For a complete list of participating restaurants, serving hours, and menus, please visit www.mysticchamber.org.